Bidadari strikes a perfect balance of classic comfort, modern safety & convenience, and adventures underwater and above the surface for all ages and levels of bravery. The boat is 37 metres long and can easily handle any local sea conditions. There are six cabins which all have air conditioning and en suite facilities, and usually more crew than guests – ensuring a great service throughout every cruise. The boat was built in 1996 in South Sulawesi, at the famous boat-building shipyard. Using Ulin ironwood, the yacht can sail on the wind as well as being powered by its powerful Hino engine. There is a wide range of safety and navigation features, as well as plenty of space for guests to enjoy the sea breeze or air-conditioned luxury. In addition, Bidadari has sea kayaks which can be used for free by guests. The theme for Bidadari is classic-styling, comfort & safety, and enough space for up to 14 guests. The cabins and en suite bathrooms are cosy, more than spacious. 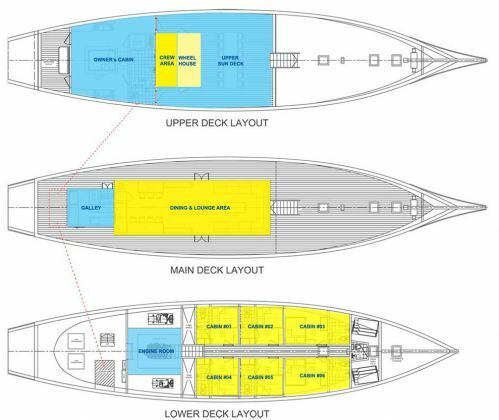 There are four decks, with the uppermost for sunbathing, looking out for dolphins or gazing at star-filled night skies. The cabins are below the main deck, and either have twin, double & single beds. The saloon / lounge is air conditioned, and there are plenty of places to find some privacy or socialize with other guests and/or the friendly staff & crew. For everyone’s comfort and safety, Bidadari is a non-smoking boat, which makes it quite unique in this part of the world, where most locals and western dive staff appear to chain smoke whenever not underwater. 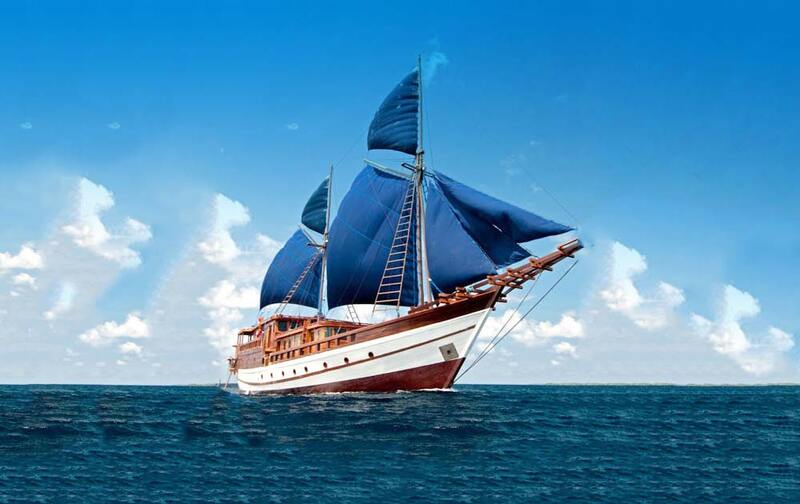 Most trips on Bidadari sail from Labuan Bajo in Western Flores, or Bali’s Benoa Harbour, and cruise lengths range from a few days to over one week around the best dive sites of The Komodo Islands National Marine Park or the east side of Bali and the Gili Islands of Lombok. However, in 2016 there are several other locations in Indonesia where Bidadari sails from and cruises to. These include Ambon, Raja Ampat and many more amazing places in The Banda Sea & Ring of Fire. Not all cruises are for scuba diving, but most are. There are trips which are better for snorkelling or for visiting the islands to see Birds of Paradise and even surfing. If you are unsure about the activities of each trip on the schedule, please feel free to contact us for clarification. The itineraries below are for Bidadari’s diving cruises. Please contact us for detailed itineraries for the non-diving cruises aboard Bidadari.